Mmmm! I think I should have repeated the centre block somewhere. 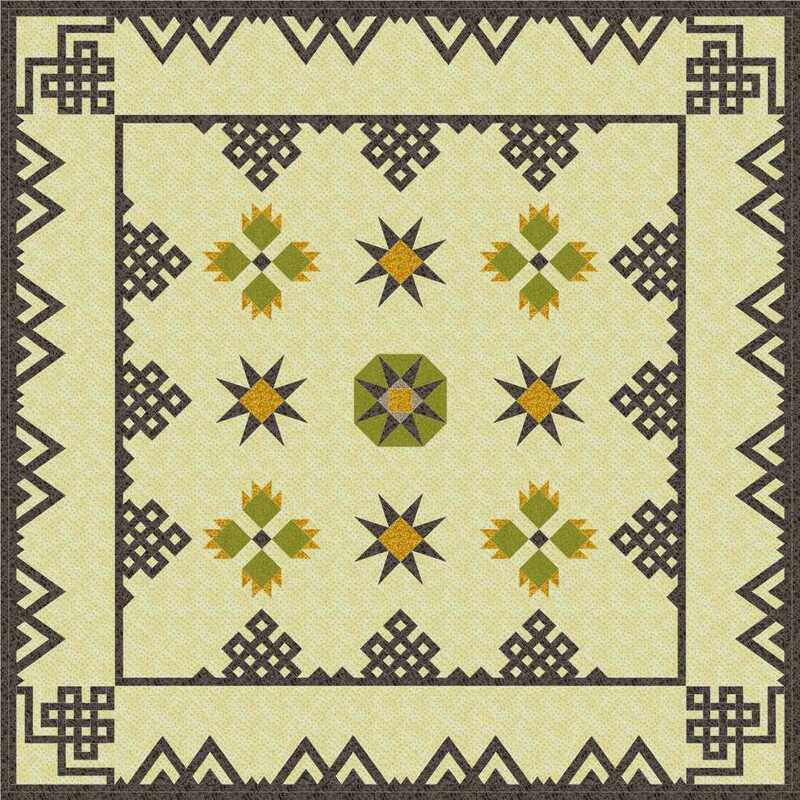 I am a quilter who designs many more quilts than I will ever make, and I am sharing one quilt design every day in Virtual Quilter. I also share my completed projects in Stuff-Ups, and Christmas decorations in Christmas Everyday of the Year. This entry was posted in EQ on Point, Patchwork, Quilt and tagged Blocks on Point, EQ on Point, On point, Patchwork, Pieced, Quilt. Bookmark the permalink. I think you have a point, about the centre block – what if was a blank area left for some really pretty quilting, or trapunto of the Celtic Knot-like designs on the edges… I like the idea of reapeating elements in the quilt lines. The corner blocks of the outer border are spectacular. The most obvious starting point for the quilting design is the applique and piecing …… repeating the shapes and lines unifies the two. There is usually room to add some other shapes too, but to me it always looks better if some shapes are repeated. Those border corner blocks are wonderful …. I love them together with simple straight pieces in the side borders. My favourite of all the borders in the EQ library. All words, pictures and diagrams on this site are covered by international copyright law. Please don't copy or pin anything on this site without permission. Sheesh, I can pin myself for real anytime! I am a quilter who uses a computer program to design way more quilts than I could ever make in several lifetimes. The quilts featured on this site have never been made. No stash has been harmed in the process. This site is a chance to show the un-used and un-seen designs to others, and occasionally share designs by making some EQ6 project files available by email on request. Please note that my only association with the Electric Quilt Company is as a very satisfied customer. I prefer to be in a tag free zone and award free area. I am just happy to know you came for a look. The designs and information on this site are not to be reproduced by any means or used for personal gain without the express consent of the copyright owner. In many cases all you have to do is ask!